The Air Force Materiel Command’s Science and Technology 2018 Wargames tested the military utility of more than 30 next-generation warfighting capabilities against a real-world operational scenario, focusing on mission sets that include air superiority, command and control, base defense, sustainment, strike, intelligence and more. 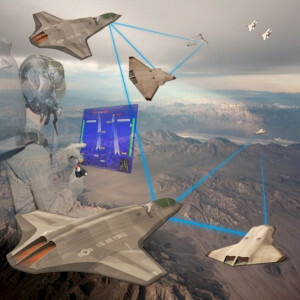 The autonomous wingman concept, graphically represented here, is one of a number of command and control concepts vetted during play. Capability concepts to ensure the Air Force’s ability to fly, fight and win in the year 2038 were put to the test during the Air Force Materiel Command’s Science and Technology Wargame 2018, Nov. 5 to 9. The final S&T 18 technical report will be completed by January 2019 and will include key findings, insights and recommendations for Air Force technical teams.